Coffee fuels the creative economy, with countless cups of coffee brewed and consumed daily in every office around the globe. However, how often do drinkers wonder what type of coffee they are drinking, how it is grown, and who grows it? Enter Coffee Story, a small startup founded by Manfred Chew and Colin Chng in Singapore. They have an ambitious dream: not only do they want to raise the quality of the coffee consumed in Singapore, they also want to educate people to appreciate and understand coffee origins, quality and culture. “There is still little understanding in Singapore about quality coffee. We want to change that.” Said Manfred. “Coffee Story was born with that dream in mind”. The company officially started one year ago in Singapore, but it took at least 2 years prior to get everything ready. 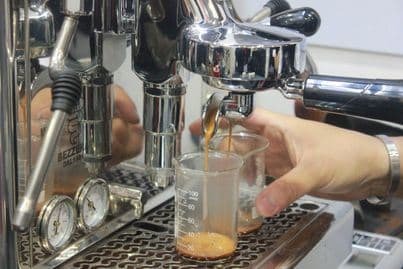 “When we started, we noticed that most of the coffee consumed in Singapore comes from Central America and it is of not very high quality” Manfred said. “Yet, there is excellent coffee grown in South East Asia. We source all our coffee from Vietnam, which started moving away from mass farmed coffee 10 years ago and is now growing high quality beans”. Manfred recalls the early days when they started looking for suitable sources of high quality coffee beans. “We decided to source coffee beans directly from farmers, so we went to Vietnam to meet them. We really were not prepared for what happened next. We thought we would be visiting lush coffee plantations, chaperoned in large SUVs. Instead, when we reached the farmers’ village, we saw the farmers waiting for us on small scooters. We hopped on the back of the scooters and started climbing very steep, terraced, mountain-side coffee plantations. It was quite an adventure.” Yet, Manfred and Colin remember fondly those early days. “We learnt so much about how coffee is grown, how long it takes to get high quality beans, and the type of soil that gives you the best variety. Most importantly, we learnt to respect the farmers’ labour, understand how much work they put into growing coffee at such high altitudes, and the daily sacrifices they make so that we, in Singapore, can get our daily caffeine fix”. Manfred and Colin decided to join JustCo a year ago: “We really liked the overall environment, very conducive to collaboration. We felt JustCo’s environment is at once professional but comfortable, it has a true homely feel. It also aligns with us because JustCo, like us, is a young brand but portrays a very professional look. We like JustCo’s community, a mix of International and local tenants, which helps us explore different coffee habits and cultures. Clearly we made the right choice.” But this is not the end of the story, it is just the beginning. From a member, Coffee Story have become one of JustCo’s partners. They have been appointed to manage the cafes at selected JustCo spaces, so other JustCo members will be able to enjoy Coffee Story’s amazing brew. This is just one of the many amazing stories that happen everyday at JustCo. We look forward to welcoming you to our community.